Country ham. It’s one of the top five things I miss about the South. That list in no particular order also consists of sweet tea, snow cancellations, Bojangles, and BBQ. In North Carolina you can walk into almost any grocery store and find a display of ready-to-cook country ham in several “styles;” my favorite one features a NASCAR portrait on the packaging. I work around this geographic obstacle by having the Alpha Family mail packs of county ham to me throughout the year. Don’t worry, they don’t need to be refrigerated; these hams have been brined and cured, and are therefore quite salty. 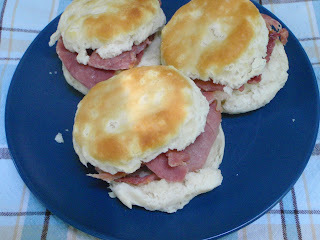 If you've never tried country ham before, I recommend starting with a pack of biscuit cut or center cut slices. If you are brave and go for the whole ham (a big commitment, even for me), you’ll easily find them by looking for the signature cloth bag. One of the first things you’ll notice about the ham is the mold. Don’t be alarmed—this is what happens after many months of curing. The mold should only be on the outside of the ham, and after scraping it off and slicing it up, you’re good to go. Before cooking the ham, I should mention again that it is extremely salty. Some people prefer to soak it for a few hours before preparing it. I think these people are wimps, but you can’t say I didn’t warn you. Now what? Fry it up and throw it in a biscuit. The ham only needs to be heated, not cooked, so if you fry it, a minute on each side will do. For crisper slices I add a little water to the pan and turn the slices often until the water evaporates and a light brown crust forms. Now for the biscuits. I am very particular about this part, so unless you make delicious homemade, southern style biscuits (dense, buttery, melty-in-your-mouth) then you should get this kind at the store: Grands Buttermilk freezer biscuits made by Pillsbury. They are frozen and come in a bag. If you are buying biscuits from a tube, you are wrong. If your biscuits are described as “flaky,” wrong again. Follow cooking instructions on bag, then enjoy breakfast. Where can I order this delicious treat if I can't find it in the store? Try going to juniorjohnson.org. Go for the gift box and send some to me.